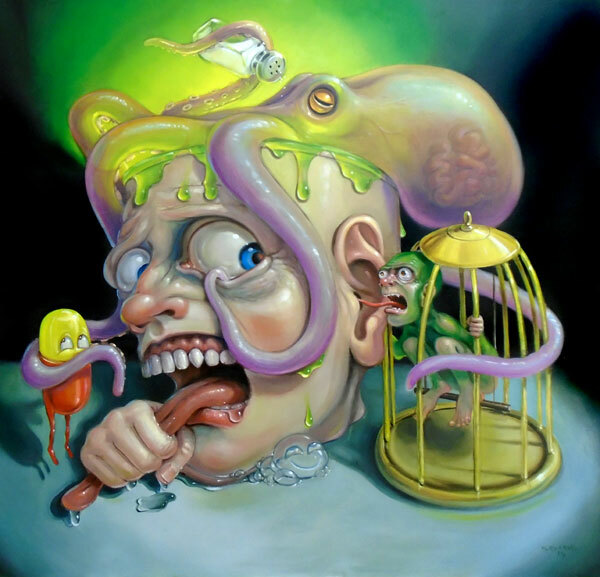 So it is not so much pop-surrealism as “existential editorial cartoon realism” – Stephen has tagged his work thus because that way it sounds more intelligent, pretentious and funny at the same time. The body of paintings weaves an eclectic tapestry of cultural and social influences. At one moment it may make a single-punch-line commentary on pop culture, while the next it may construct a complex and playful diorama probing into the outer perimeters of human nature. Stephen’s website is www.stephengibb.com. You can purchase his works at Saatchi Art (www.saatchiart.com/sgibb) and connect with him on Facebook (www.facebook.com/bubblegumsurrealism) and Instagram (www.instagram.com/stephengibbart/). Revenge of the Sycophant Scorned by Stephen Gibb. Used with permission. Cheesy Dorito by Stephen Gibb. Used with permission. The Politician by Stephen Gibb. Used with permission. Time Desecrates the Fossil Record by Stephen Gibb. Used with permission. Secret Agenda of the Midnight Circus by Stephen Gibb. Used with permission. Heavy Thoughts by Stephen Gibb. Used with permission. The Cracker Cracks a Smile at Edge of the Primordial Soup by Stephen Gibb. Used with permission. The Pervasive Randomness of Chance by Stephen Gibb. Used with permission. Darkness falls on the whitebread world by Stephen Gibb. Used with permission. Contemplating Infinity by Stephen Gibb. Used with permission. Does a Genetically Modified Mouse Dream of Electric Cheese? by Stephen Gibb. Used with permission. Angry Cake by Stephen Gibb. Used with permission. Keeping Mum in the Presence of a Toxic Personality by Stephen Gibb. Used with permission. Birth by Stephen Gibb. Used with permission. I haven’t heard of Steven Gibb but remember Mad Magazine. I always loved Hieronymus Bosch. Gibb’s illustrations remind me of a pub sign of The Cat and the Fiddle, a pub me and my brother used to sit outside of drinking cola while my mum and dad were inside. It was from the nursery rhyme of the same name and had a cow jumping over the moon on one side and a dish running away with a spoon on the other. It was eerie a bit like this, but we came to love it. The pub still exists but it is now a Harvester and a horrid generic sign now replaces it. Just checked out the rhyme. Very cute. And yes, it is quite like Stephen Gibb’s imagination. Is the pub you’re referring to in Cheshire…or Hampshire? I wasn’t familiar with Mad Magazine – I think I’m a little too young for that – but it looks cool too. In Hampshire – tried to google a photo but just got the new Harvester. I did read both your pieces just now. I marvel and praise your stamina, persistence and solid performance. They are of a very high standard. I feel so small because I don’t have the ability to analyse your work. May your ‘tulika’ ever be a source of inspiration to all! Thank you so much, Uncle! I feel that given the amount of information I have access to, I am very lazy in my conduct. Successful bloggers publish up to 3 posts daily and here I keep skipping days! And you are most welcome to offer your comments. I learn from one and all. Every point of view is precious. Thanks for stopping by! And yes, I totally agree! The paintings look very “real” to me. In my original comment, I unconsciously typed ‘don’t’ when I was thinking ‘do’. Doesn’t change the reality at all. So that makes them the pictures of the inside, no? Inside – you mean “the mind”? Inside–but I am not sure the ‘mind’ covers all the inside…there is some mystery there, no? I had a good friend in sculptor Robert Arneson and Gibbs work reminds me of him.